The Lumpini park is one of the rare wide green spaces in Bangkok, and it’s a great place for a break from the concrete jungle. The large artificial lake gives it a serene atmosphere, and you can rent small boats to paddle along. In the morning hours you find Chinese people performing Tai Chi here. This is of course the ancient health exercise from China that has been used for many centuries already and puts an emphasis on slow movements of the whole body combined with conscious breathing exercises. It’s also very popular with joggers both in the morning and evening hours. During the daytime, it’s least crowded because of the direct sunlight and the typical Bangkok heat. However, there are plenty of shadowy places where you can escape to. If you’ve done a lot of the “typical” Bangkok sightseeing, then this place can be a nice variation that is just around the corner of Silom and Saladaeng. (The area where the popular Patpong Night market is located). 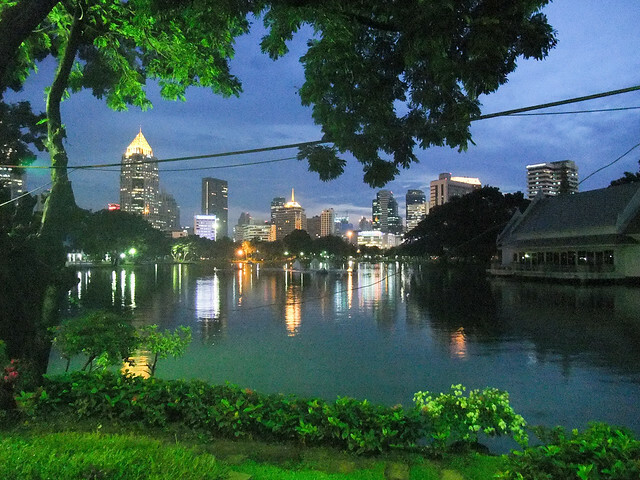 Below is an article about Bangkok outdoor fitness options that also mentions the Lumphini park. It is titled “Bangkok’s Best Outdoor Fitness Options By MRT & BTS” and is written by guest author Daniel Remon, who runs Fitcorp Asia. 1)	It’s Free! No membership fees. 2)	You beat the overcrowded gyms. 3)	You don’t have to compete for machines or equipment at the gym. 4)	You get outside away from the traffic and out of your office. 5)	100% natural. Listen to the birds and squirrels, especially in the morning. 6)	You burn more 30% calories! Faster fat loss. 7)	You can exercise with your friends, stronger support to increase adherence. 8)	You won’t get harassed by sales people. 9)	Research shows exercising outdoors reduces stress too! 10)	You can breathe fresh air instead of being stuck inside the air conditioning. You can access Lumpini Park from various stations. Lumpini MRT and Silom MRT as well as Silom BTS. Lumpini is one of Bangkok’s largest public parks and in addition to having a 2.5 km track, you can also join in Tai Chi classes, aerobics, strength training in the ‘jungle gym’ as well as swim! Queen Sirikit and Sukhumvit MRT, and Sukhumvit BTS (Just a 400 metre walk). My favourite park! A nice running track, with lots of different areas to discover including an aphithetre, stairs,a board walk along the lake and lots of park benches. Prompong BTS. Benjasari is a small, yet convenient park to get to and there is plenty of shade if you don’t like to be out in the sun. There is also a public swimming pool and you can join aerobics in the park in the evenings. Mo Chit BTS. A quiet large park with nice paths and super easy access to the BTS and MRT. To get fit and to burn fat it is essential for you to raise your heart rate to levels that force your body to work harder. You must constantly change the stimulus for your body to respond to or you will fall into a plateau. A plateau is when you continue to do the same exercise however your body does not respond and you do not continue to lose weight or make improvements in strength or cardiovascular fitness. Jog for 30 seconds and power walk for 2 minutes. This elevates your heart rate and allows for plenty of recovery in between. You will be able t maintain a higher heart rate even though you are walking, ad this will allow you to burn more calories and therefore more fat! Similar to interval training, Fartlek is a Swedish word meaning ‘Speed play’. You need to jog for as long as you can, then walk for as long as you need to recover before preparing for your next round of jogging. Continue for a minimum of 20-30 minutes. Yes even swimming can be an effective fat loss and fitness solution. How you swim will determine your results. Just any other form of exercise, to get fit or to lose fat, you must elevate the heart rate to maximize energy expenditure, calorie burn and fat loss. Functional strength relates to any exercise which develops strength by using your body weight only. The basics you can start with include squats, lunges, push ups, abdominal crunches and bench dips. These five exercises alone will give you a complete full body workout in under 5 minutes!! Aim to complete 12-15 repetitions of each exercise. In addition to burning more calories, research shows that functional full body training is the most effective fat loss strategy combined with a sound nutrition program. 1) Start out slow. Exercise consistency and adherence is far more important than trying to break records! 2) Plan your schedule. Make an appointment with yourself so you don’t find excuses not to exercise. The best tip for exercises adherence is to exercise first thing in the morning before work. 3) Ask your friends to go with you. Make your exercise a social activity. 4) Warm up and stretch! I can’t stress this enough. Stretching will reduce the muscle soreness; increase your flexibility, blood circulation and aid in the prevention of injuries. 5) Join an outdoor fitness boot camp program. In addition to working with trained and experienced fitness professionals, Bangkok Boot Camp offers a motivational and social support group to help you achieve your goals faster and stick with your program. 6) Smile! Be active! And be Healthy! Daniel Remon is the founder and Managing Director of Fitcorp Asia, an innovative health, fitness and performance company specializing in functional outdoor boot camp programs, healthy education programs as well as personal training, fat loss, golf fitness and corporate health programs in Bangkok. http://www.fitcorpasia.com, http://www.bangkokbootcamp.com, http://www.golffitnessu.com Tel: 02 661 7900.